It is easy to be labeled as “another franchise” when you do business under the brown identity. But the UPS store on the North East corner of Lindsay and Warner is not just your ordinary postal shop. Owner Mike Biggy is more than just your backyard business; he is your neighbor too. 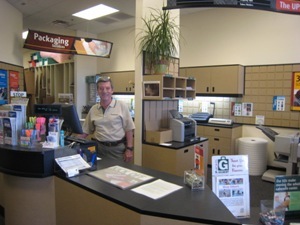 Mike offers the basics of reasonable shipping of anything to anywhere in the world, affordable mailboxes and quality printing. Besides the valuable products and services he provides, he also prides himself on customer service and fulfilling customer needs. It isn’t just any UPS store that you can walk into and have the owner greet you and remember your name, but that is the culture of Mike Biggy’s UPS store. This entry was posted on September 25, 2008 at 10:57 pm and is filed under Uncategorized. You can subscribe via RSS 2.0 feed to this post's comments.